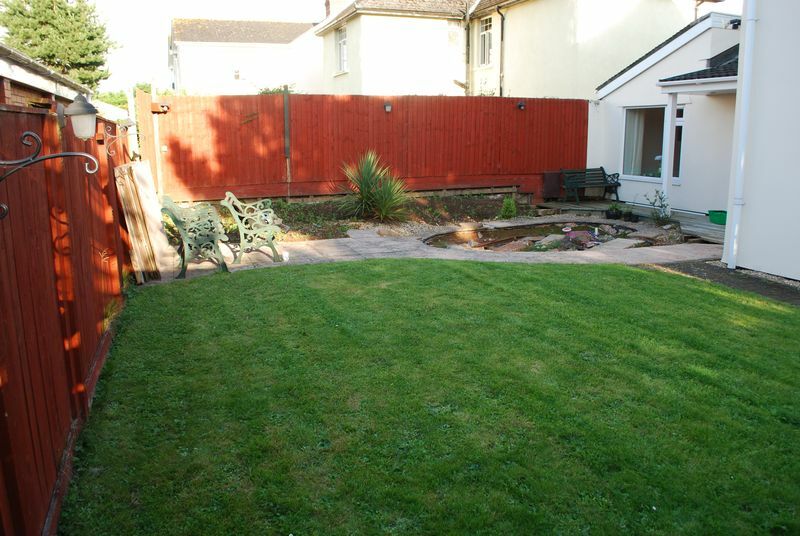 My name is Kerry Jackson, proprietor, principle garden designer and fully fledged hands-on landscaper of Jackson’s Landscape Design, Newton Abbot, Devon. A warm welcome to you and many thanks for your time viewing my blog, I will do my utmost to explain in detail how I undertake a contemporary garden build by means of photography, videos, and in-depth explanation. 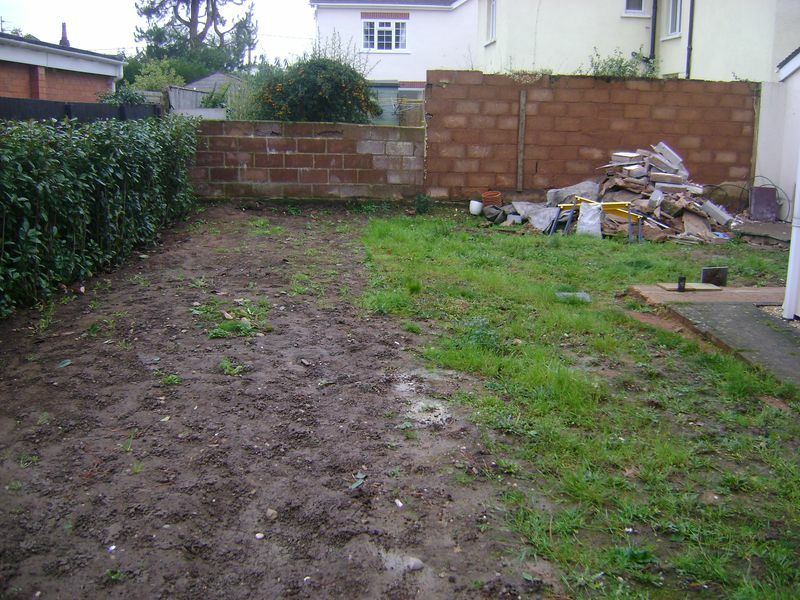 I trust you may find this bespoke high-quality landscaping project useful in some form and If I can assist you in any way I try my very best to accommodate your questions or landscaping requirements. 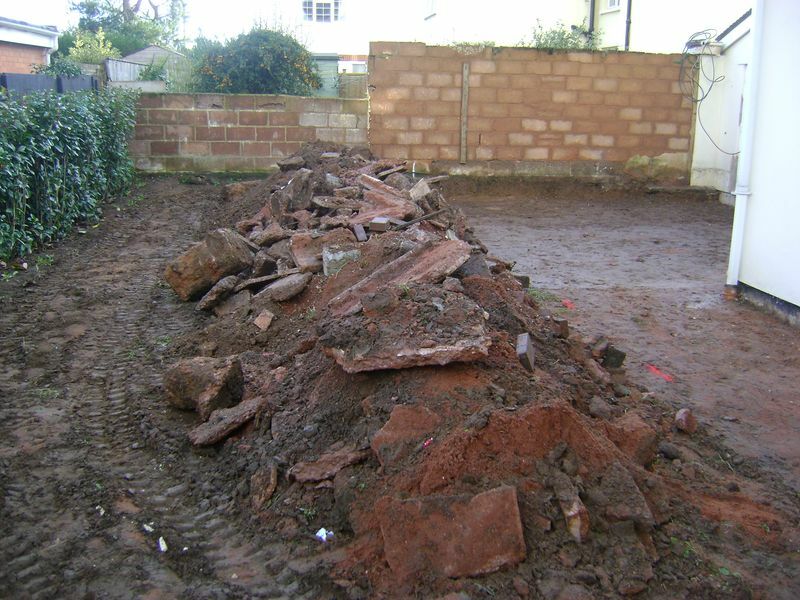 Having been commissioned to design this rear garden near Exeter, Devon my brief was very clear. The budget was set and with this brief, at the forefront of my mind, I commenced the garden design process. After a couple of months of thought and drafting concept plans this 3D design, below, was approved with a signed contract, now the time has come to put vision into reality. With my van loaded with the appropriate tools the team and I head up the M5, once we arrive at the property, my first task is to issue work/apology notices to all surrounding neighbours, I’ve always introduced myself as the first port of call should any problem arise, you’ll be surprised with the number of friendly waves and eventually other projects we receive. Common courtesy costs nothing but goes a long way, but it remains in a potential prospect’s mind for years. The micro 360 excavator is delivered on time and the team set about dismantling a section of fence for access. I’ll put the kettle on, which is extremely rare, I’m one of these people that can’t operate without a coffee first thing in the morning. 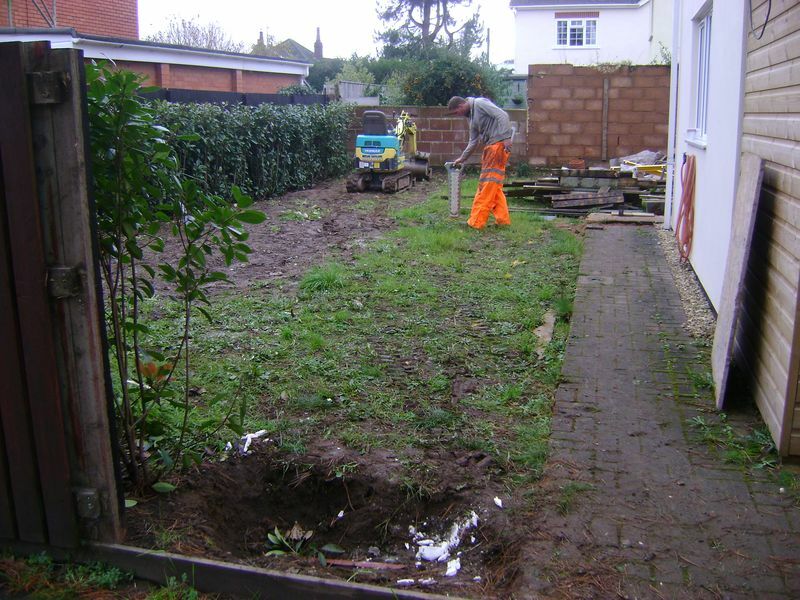 The excavator may well be on the area to be landscaped and ready to start digging concrete footings, leveling the garden etc, however, I’m not as I’m completely blind as to what lies below the visual surface. In order to gain some insight as to what lies below the topsoil I always scan the entire area in both directions with a cat scan cable detector, should any live cable be within the landscaping area I will detect them and mark each high detection point with a marker spray, with gentle sweeping motions I can build a mental image of the direction. Any live cables will be hand dug, we will also dig by hand around gas and water utility services. The garden is clear of any live cables and I’m happy to proceed. With a ditching or grading bucket, the flat one with no teeth to you and I, I remove the stockpile of rubble from the area of the existing large rear wall towards the opening in the fence where the road lies and within reach for my later Hiab grab driver. 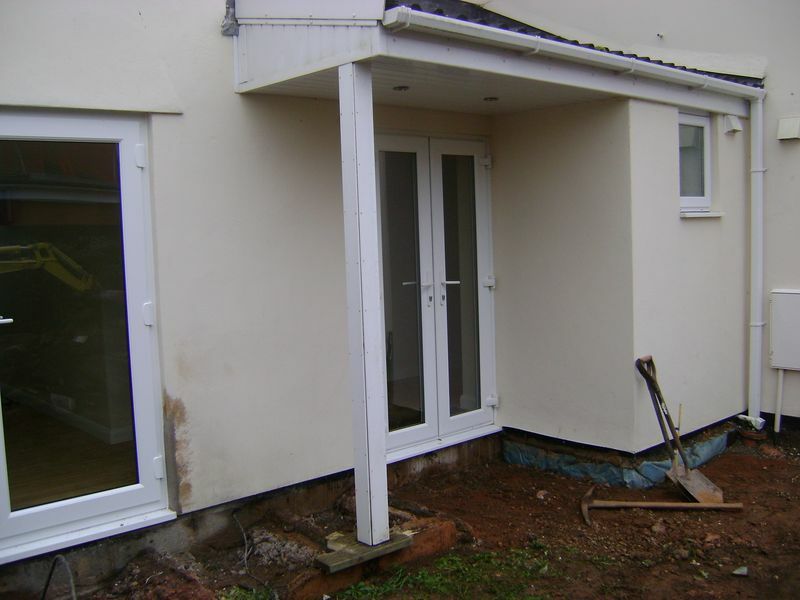 You’ll note the supporting pillar to the overhang, again I’m blind as to how this was installed by the client’s builder. In order to gain clarity we cut the decking around the support and remove all surface material, it’s a good job that we don’t tear the garden to pieces in our haste !! The treated softwood decking supports the pillar, which in turn supports the overhanging roof, as this unforeseen, a work change order will be filled in with my proposals to rectify and all costings. I will acro prop, on clean timbers, the soffit to support the roof once I start the main frame for the Saige composite black decking. A datum level is used via a yellow sprayed pin as my key point throughout the entire project, this pin will not be moved at all. 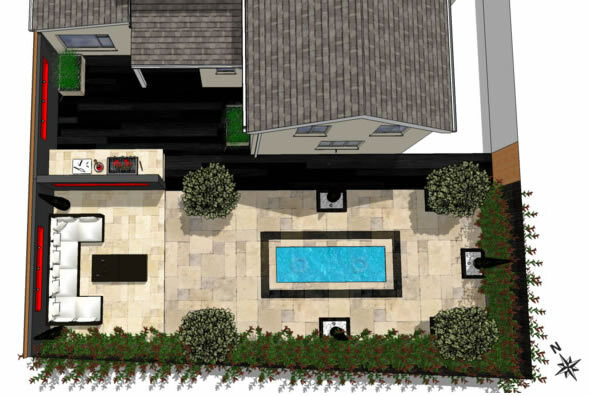 For this particular landscaping project I am governed by three levels, the whole project will be built from the seamless transition from threshold to composite decking, to paving at the same level and a 150mm riser. 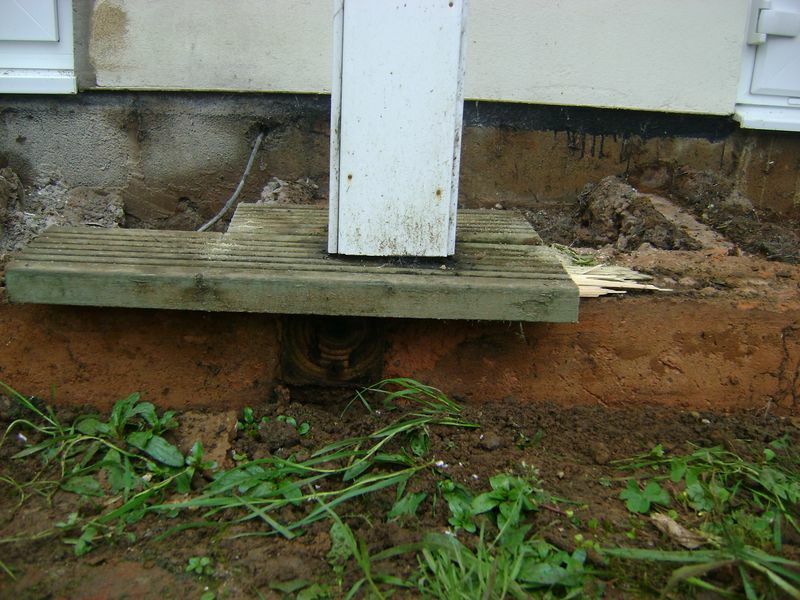 Even though the decking and paving finish floor levels, FFL, are the same, the area preparation levels differ, hence the reason for three datums levels. Blue tape at surface, you can just see it with zoom, is the Saige composite decking dig level, allowing the depth of a 28mm composite deck board, 150mm deep joist and 50mm of air circulation below the joist. White tape in the middle of the pin is the main paving level, allowing for 100mm consolidated scalping, 50mm full motar bed and 28mm Marshalls Fairstone paving. 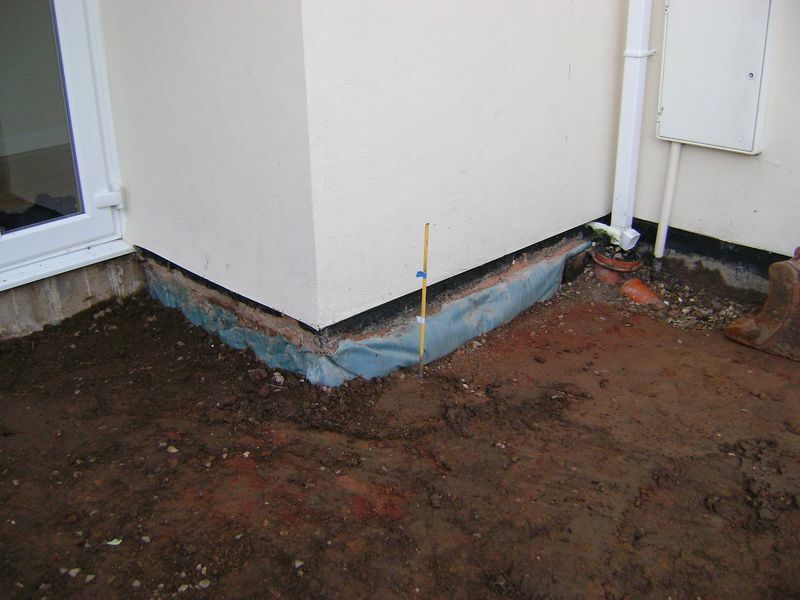 The top blue tape is the datum level for the 150mm step riser, allowing for 100mm consolidated scalping, 50mm full mortar bed and 28mm Marshalls Fairstone paving. Using a 360 rotating lasor level I am able to work up to 300m from the lasor with a receiving eye and staff, the lasor glass must be kept dry other wise it will distort the lasor beam and I’d be wasting my time and money removing to much subsoil. PreviousPrevious post:A Landscapers garden preparation DevonNextNext post:Softwood Decking Slippery Devon? Don’t fall again! !